Railway Preservation News • View topic - What is this Track Tool? What is this Track Tool? Post subject: What is this Track Tool? We have one, but I have no idea what it is or what it does. Anyone here know? Post subject: Re: What is this Track Tool? I presume its missing a pole, a wooden pole for the one part. It looks like it has lock holes for metal rods to make a stop in its movement. it looks like it locks onto the rail, and the other hook it attached to something. You might be able to hook it onto a car and yank it a bit without a locomotive. But for the direction you yank you might be pulling a rail to get it in gauge, or to yank out an anchor. But it looks like your attaching it to one rail to yank on something else to move. I think dinwitty is on the right track. This might be an antique rail lifting clamp - in which case the handle would be used to fasten the two jaws around the head or base of the rail, a pin would be inserted to hold the jaws in place, and the chain attached to a hoist of some kind to pick up the rail. These come up for sale online from time to time, but what we really need is a photo of an old-time track gang using one or a manufacturer's ad from an old railway journal. Not necessarily a railroad item, I don't think. I will take a guess, it's a tool to open struck boxcar doors? one stab...a rolled rail adjuster. A tool to tighten outside braced car siding? Hook on the bottom and have a chain and hook on the top board? A long while ago I posted looking for info on the one I have (same as yours minus the chain) and general consensus after putting it across multiple forums (here, railroad.net, smokestak, and a few industrial ones), was that it was used to control a light chain bound load, due to the shape of the hooks. Basically a bundle of items would be chained as tight as possible, and the split hooks of this item would be dropped over the bundling chain and grab below a link on both sides about a foot and a half apart. The bundle would then be lifted, the handler would use the post (similar to the ones used in a peevee or car mover, jammed into the socket) to guide the bundle into place. Due to the strain on the thin castings of the arm, I doubt they were meant for loads of more that a few hundred pounds. So more for handling light bulky items. Still have yet to see an ad on these things,especially with how often they pop up, there should be some forms of advertisements, possibly in hardware or rigging catalogs? From some googling it look like it could be a fence stretcher. But the description makes it sound like you need multiple tools for this to work correctly. Kind of reminds me of a Peavey..... maybe for tie work? I also have one of those tools whatever they are for? A friend gave me mine 25 plus yrs. ago. 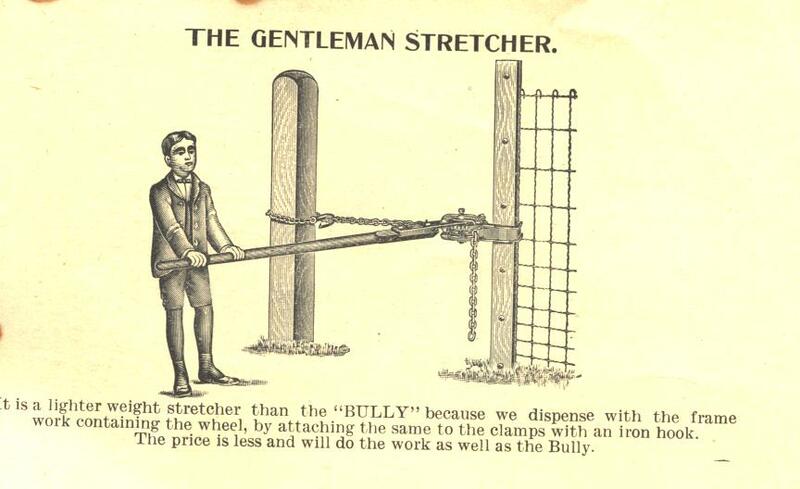 Someone else years back suggested to me they thought it also was a fence stretcher. Another friend thought it was RR related somehow due to it having a handle part that would take a wood handle like on the older RR jacks. I have no clue what it is for? I just dug it out of my barn to take a look at it and can find no casting marking letters or numbers on it what so ever. It is identical to the tool in Ricks photo. The chain is approx. 4ft. long with the hook on the end. It's not something one would want to carry around for very long as they are a tad heavy! I got to looking at ours and I agree with crij, the jaws are designed to grasp chain. I believe it would be used in the vertical orientation hanging from that length of chain. With the handle in the upper position, another chain would be placed on the lower hook then the handle moved downward. Then the other hook would be placed on the chain and the handle lifted upward. In this way a load could be lifted or even lowered. The other holes appear to be there so a rod could be inserted keeping the handle stationary if desired. I have seen these several times in the past, and I'm surprised that with how common they are that nobody seems to know what they are used for. I just can't think that such a cumbersome device would actually be used as a chain hoist when in that time period real chain hoists were readily available. it doesnt have a permanent wood lever, it would make it more bulky, you could use any available post, or end of shovel, whatever. It makes sense for a compacting down tightening down a load with the use of other chains, this would compact the load in while you can adjust the other chains to fit, then release moving the tool to another location, compact again, rinse repeat. loads of lumber, piles of pipe...etc. You don't want these loads popping out, I went to a South Shore business meeting once, some trucker on the nearby tollway had its load fly off and it hit the South Shore tracks, heavy chunks they broke the rail below. They discussed the impact of this damage in the meeting and the loss of revenue due to the required service outage. nothing looks exactly like the above tool, but the concept it exactly the same, 2 hooks with a lever to tighten down a load. So you can grab a chain, an edge wherever, use the tool to tighten down, lock it in with a pin for a moment, "jack it back" so to speak, and give it another nudge tighten down, readjust your load chains, jack it down again you remove the tool when satisfied its tight enough. The pin could be any hardware bolt or hardened steel pin. I seriously doubt it could be used to tighten chains like a binder as all 3 pivot points are in the same casting as the handle. all you would do is rock the load, the pivots would have to be able to bypass each other to tighten the chain. Dinwitty, the handle socket is 3-4 inches in diameter IIRC, so way to large for a shovel handle, but correct size for a pevey or carmover handle.